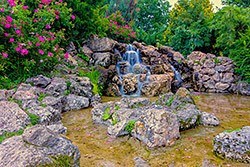 A Missouri and Kansas landscape will never be complete without water features. Whether you have a Mediterranean-inspired or modern theme, the best amenities to add are waterscapes that can enhance the beauty and add market value to your landscape. But aesthetics and value are not the only benefits that these landscape additions can give you. Health experts all over the world agree that water features, like pools, can promote your health by providing you with clean and fresh air as well as low-impact exercise areas. They have also been found to improve psychological health, as the sound of the rushing water can calm the senses. Fountains. What effect do you want to achieve? Would you like water-spouting statues that dispense water through a hole or would you rather have cascading fountains that look like geysers? Whichever approach tickles your fancy, we can definitely make it happen. Ponds. Get a step closer to nature with our awesome ponds. You can opt to breed fishes and water plants in there or even add a waterfall to make it look more natural. Bird baths. Be a friend to winged creatures by giving them water features where they can preen themselves. Baths are magnets for birds and you will surely be delighted with lots of colorful birds gathering around them. Artificial streams. Our artificial streams look so natural that your friends won’t know that it’s man-made unless you tell them. Waterfalls. Can you imagine paradise without a waterfall? Transform your landscape into a nice, idyllic spot where you and your loved ones can gather and admire the beauty of this water feature. What’s more is that it can be placed anywhere and everywhere – we can set it up against a wall or fence, on top of a table, or have a big one installed to serve as a focal point in your landscape. Pools. We can build you any size or type of pool – geometric, freeform, or infinity –just name it and we’ll build it for you. We understand your need to unwind and relax after a long day at work or bond with your loved ones during the weekend. That’s why we ensure quality workmanships on all of our waterscape projects. We have teams of licensed experts who can give you recommendations as to what type and size of water features will blend effectively with your landscape. We can also customize them for you. Just tell us what you need and we’ll include them in our design plan. At Outdoor Escapes, we make sure that all our materials are of superb quality, that’s why we only get them from the most trusted suppliers in the industry. Our partnership with Belgard further assures you of this, Belgard being a reputable and trusted materials provider. And because we service most parts of Missouri and Kansas, you can be assured that we’ll be in your property to provide repair and maintenance if and when there’s a need for it. 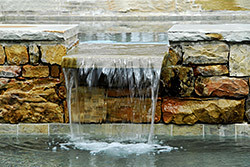 Take advantage of the many benefits of well-built water features. You and your loved ones will definitely enjoy the beauty and health benefits these landscape additions can provide. Call us at 816-529-5991.